Welcome to Day #4 of Chocolate and Mexico Theme Week. 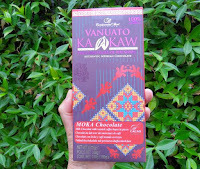 Today's Vanuato Kakaw Moka Chocolate was a milk chocolate bar with roasted coffee bean pieces, made in Mexico. 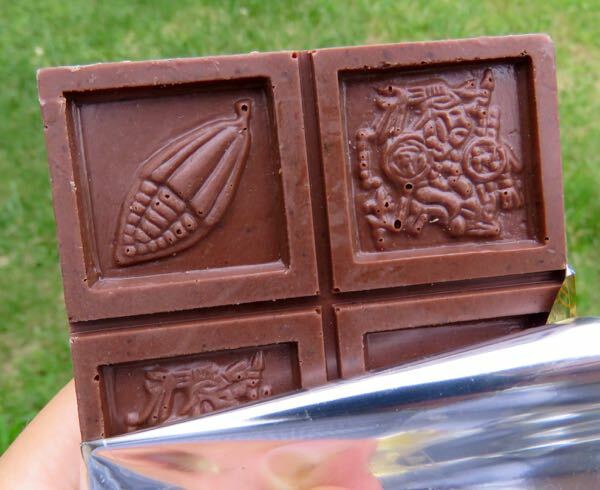 The relatively smooth, sweet 36% cacao milk chocolate base was complemented by the robust, crunchy bits of roasted coffee beans, helping to reduce the sweetness a bit (a good thing for most milk chocolates). A generous helping of coffee also gave the bar a robust coffee flavor and finish. Vanuato Kakaw bars also include design and packaging elements tied to Mexican heritage. 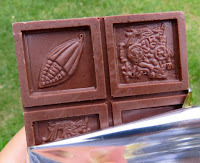 While difficult to see in the small images shown (right), a likeness of Ek Chuah, the cacao god, is appears on this bar (and other Vanuato Kakaw bars), along a cacao pod (fruit that contained the cacao seeds or beans that are used to make chocolate).